George W. Bush and torture: America’s highest officials are responsible for the “enhanced interrogation” of prisoners. 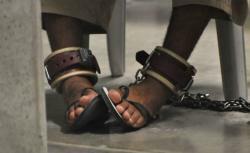 A Guantanamo detainee’s feet shackled to the floor. “Gitmo” has been a source of controversy regarding the torture of prisoners. Thanks to a Freedom of Information Act lawsuit—a lawsuit the New York Times has called “among the most successful in the history of public disclosure”—we now know much of what happened in those secret spaces the Bush administration created. Under that litigation, the American Civil Liberties Union gathered nearly 140,000 formerly classified documents from the Department of Defense, the Justice Department, and the CIA that detail the abuse of prisoners in U.S. custody in the “War on Terror.” My job, as the author of the website www.thetorturereport.org and then of the book The Torture Report: What the Documents Say About America’s Post-9/11 Torture Program, was to dig through that incredible trove of documents and figure out for myself what, exactly, my country had done. The CIA has gone to extreme lengths to conceal images of Abu Zubaydah and his treatment first in a secret CIA dungeon in Thailand and later in another CIA black site in Poland—lengths that include destroying 92 videotapes of his interrogation and torture. It has paid no price for destroying those tapes, or for holding Abu Zubaydah for more than four years in its network of secret prisons, or for his well-documented White House-orchestrated torture, which included 83 episodes of waterboarding, the last one overseen by a Washington official who flew to the black site because the administration refused to believe his interrogator’s conclusion that he was not withholding information. A version of this article first appeared in the Dissident Blog on April 17, 2012.